Coming off a 12-point victory in the season-opener against Howard, William and Mary returned home for its home-opener against Fairfield. The Tribe (2-0) was looking to pick up its first victory at home after going 11-5 at Kaplan Arena last year, while the Stags (0-2) were looking to bounce back from a close 72-67 loss against Richmond. The College overcame a first half barrage of three-pointers by Fairfield to fight off the Stags and claim a 57-47 victory to remain undefeated on the season. After the Stags got the ball following the tip-off, the Tribe scored on its first possession. Junior guard Bianca Boggs picked up where she left off against the Bison with a three-pointer from the right wing. The Stags were able to answer on the next possession with a three of their own before the College went on a quick 7-0 run forcing the Stags to use a timeout with 6:16 remaining in the first quarter. On the 7-0 run, the College got contributions from three different players. Senior guard Jenna Green blew past a defender and made a short jump shot off the dribble to put the College up 5-3, before Boggs finished a three-point play after being fouled on a driving layup. Freshman guard Nyla Pollard finished the run by weaving through defenders on the fast break and finishing with a layup, prompting the Stags’ timeout. The Stags were able to cut into the deficit after the timeout and went on a 9-2 run of their own to tie the game at 12 apiece. Forward Samantha Cooper scored seven of the first 12 points for the Stags. After only scoring two points in nearly six minutes, sophomore guard Nari Garner made a three from the right wing off a pass from Green, who was credited with the assist. The Stags were unable to get their last shot of the quarter to fall and the College led 15-12 after the opening quarter. Junior center Chandler Smith opened the scoring for the College in the second quarter off of an assist from junior guard/forward Misha Jones. Smith also immediately made an impact on the other end of the court with a block on a layup attempt by the Stags early in the second quarter. 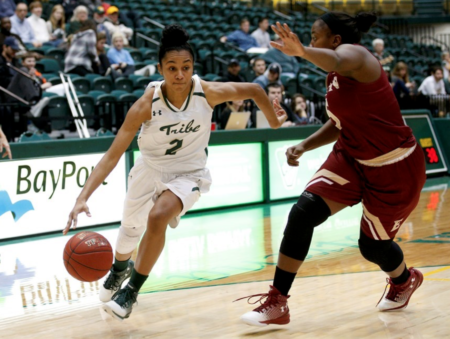 Sophomore forward Victoria Reynolds, who scored 19 points on Saturday against the Bison, scored her first after rebounding a missed jumper by Jones with just over 7:30 remaining in the second quarter to give the Tribe a 19-14 lead. The College continued to stretch its lead back out after two baskets by senior center Abby Rendle, who also had seven rebounds in the first half. With under four minutes left in the second quarter, the Stags had cut the lead back to four, but a free throw by Green, followed by a steal and a layup by Boggs pushed the College’s advantage back to eight, 27-19 with under three minutes remaining in the half. However, the Stags answered with three straight three-pointers to propel them to a 9-0 run and a 28-27 lead with a minute to play in the half. The Tribe was unable to score in the final three minutes of the half and despite leading for a majority of the first 20 minutes, trailed at the break. The College was led by Boggs and Green in the first half. Boggs had nine points and Green contributed five points and five rebounds. The Stags had six three-pointers in the first half, helping them to a 30-27 advantage going to the locker room. After a turnover on the first possession of the half, Boggs bounced back with her second three of the night to tie the game, before Green scored off a Stags turnover to put the College back on top, 32-30. Meanwhile, the Stags got off to a slow start in the second half, not scoring in the first three minutes. Cooper scored Fairfield’s first points of the half with just under seven minutes remaining. Nevertheless, Rendle extended the Tribe’s lead back to two possessions with a basket of her own on the other end. With just under six minutes to play in the third quarter, Smith kept the score at 36-32 with another blocked shot in transition, preventing a breakaway layup. The Stags were eventually able to cut the lead to two again, but Jones hit a three with four minutes remaining in the quarter to put the Tribe back up 39-34. The College was able to stretch the lead back to three possessions after Green drove into the lane and dished off to a wide-open Rendle who finished the layup. On the following possession, Green drove once again but this time pulled up and hit a shot of her own to give the Tribe a 43-34 lead with a minute to play in the third. After yet another missed shot by the Stags, the College held the ball for the last shot of the quarter, but turned the ball over with just three seconds remaining. The Tribe dominated the third quarter, outscoring the Stags 16-4 and allowed no made three-pointers after giving up six in the first half. The Stags finally broke their scoring drought in the first 30 seconds of the fourth quarter, cutting the College’s advantage to seven points, 43-36. The Tribe answered right back when Reynolds came up with an offensive rebound and was fouled with 8:50 left in the game. She made one of two from the line to push the lead back to eight points. However, the Stags did not let up and with seven minutes remaining hit their first three of the second half to get within four, 44-40. However, the Stags were unable to take advantage of a couple of empty possessions by the College and with 5:42 remaining in the half Garner drained a three to give a 47-40 lead before Swanson called timeout for the Tribe. Following the timeout, the College came up with two more stops on defense, while Reynolds scored from close range on back-to-back possessions to give the College its first double-digit lead of the evening. After the second basket from Reynolds, the Stags took a timeout with the Tribe leading 51-40 with 4:21 to play. With just over three minutes to play, Reynolds made another shot to help the Tribe to continue to extend its lead. With 1:25 to play, the Stags were able to cut the deficit to single-digits once again, with the College holding a 53-45 lead. However, they were unable to get the lead under six points, and the College made clutch free throws and strong defense in the final minute to earn a 57-47 victory. The Tribe was led by Boggs, Rendle and Green. Boggs led the team in scoring with 12 points, but it was a balanced effort from the College with five players scoring more than eight points. Rendle had a double-double with 10 points and 13 rebounds. Green, who played the entire game, also had a double-double, falling just two assists short of a triple-double. “Assists come from my teammates knocking down shots and my rebounds were from my teammates boxing out, so I think it’s just an all-around team effort,” Green said. The Tribe will travel to St. John’s on Friday night to take on the Red Storm. The College looks to improve its record to 3-0 on the season. After another road game, this one against East Carolina, the College will return to Kaplan Arena. The Tribe’s next home games will be on Nov. 25 and 27 against Loyola and Davidson, respectively. Previous articleIs it Soup, or is it Cereal?